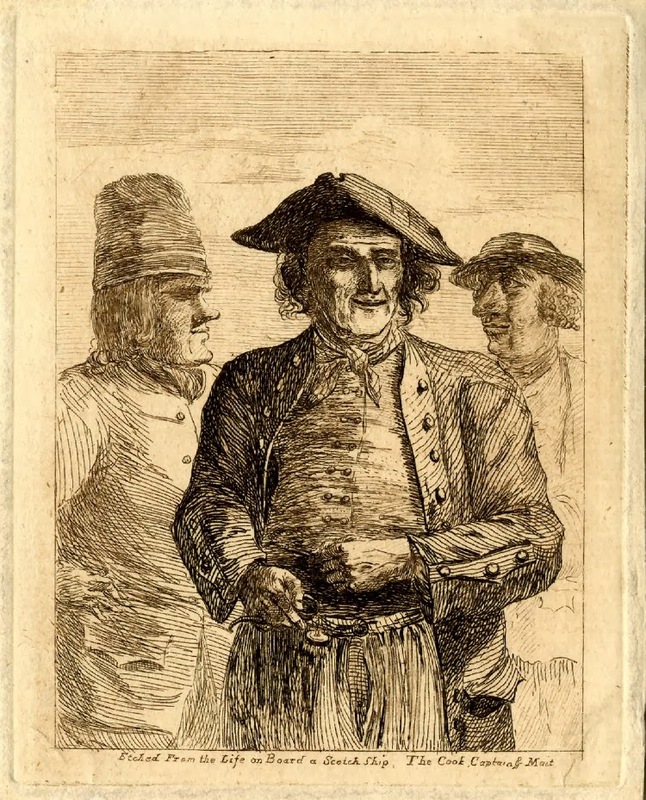 Etched from the Life on Board a Scotch Ship: Cook, Captain, and Mait, artist unknown (John Kay? ), c.1750, National Maritime Museum. Just as the specific profession (merchant, naval, privateer) is often unclear in depictions of sailors, so too is their ethnicity. With the rare exception, the origins of a specific sailor are difficult to pinpoint. American, Irish, Scottish, English, and other nationalities all mingled together aboard British and American vessels. This image is much more specific. The vessel itself is Scottish, and these men are presumably Scotsmen. We see little difference in their dress compared to that of other sailors. Assuming that the title matches their roles from left to right, we'll start with the cook. He wears a tall knit cap of a type that was fairly common in the era. His jacket is single breasted with flap pockets at the waist, with his black neckcloth tucked in neatly. The cook's hair is a bit longer, extending to the shoulders. Hairnets would not be invented for some time! The captain wears a simple cocked hat cocked over the right right. His hair is scraggly and loose, but short. A plaid neckcloth is tied to his front, and he wears a double breasted waistcoat. The jacket is double breasted with slash cuffs covered in flaps, as are his waist pockets. Slops extend down to the end of the image. In his hand is some strange object that I can't quite place. I would almost suggest them to be spectacles, which would definitely be noteworthy, but the distance between the two ovals (what would be lenses) seems too far apart and the bit extending out of his fingers has an odd curve that contradicts what we know about spectacle frames of the eighteenth century. The mate wears a round hat with a short brim over his short curly hair. He wears a black neckcloth and a single breasted jacket with waist pockets covered by flaps. Being one of the earlier images, we see that all of their jackets extend a bit longer than they would typically do in the 1770's and 1780's. Still, they are far shorter than was fashionable for many other professions at the time.